What is the most ideal wire termination for these type of terminals? Although it will keep the wires from fraying, it takes a lot of practice to deliver a consistent job each and every time. Also, soldering inside a car is far from ideal, especially in awkward spaces. Wire terminations are also almost never soldered in aircraft and motorsport applications, same goes for automotive manufacturers. Must be a good reason for that. This seems like a good option and I believe the VW factory did this. However, the tools they used made a rather small indentation which doesn't seem very reliable to me. I can find proper crimping tools that make a square or hexagonal compression, but I worry about the contact area and possible resistance with these ferrules in those round screw terminals. Is this something to be concerned about? This leaves the round shape of the ferrule intact, but, as said, there are many reasons not to prefer soldering for automotive applications. Are there better options out there? Note that if soldering wire ends and then clamping with a screw in a terminal block or connector post as seen in your photo then the majority of the wire end MUST NOT be soldered - even though this is common amateur practice and may seem to make sense. If the copper wire is solder filled so it is "solid" then the screw will compress the soldered bundle and produce a tight connection INITIALLY. However, over time the solder will deform and creep and the screwed connection will loosen and fail. For this reason, soldering wire ends is forbidden in electrical wiring codes. It is usually permissible to solder wire extreme ends only to stop the multistrand wire fraying, but the majority of the exposed end and all the portion that the screw contacts must be unsoldered. Good quality crimping tools can produce long life reliable automotive connections. 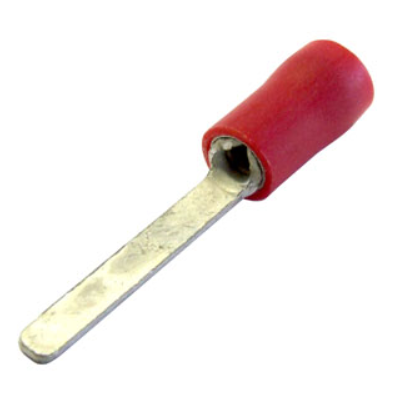 HOWEVER after market crimps are often unreliable. I have seen situations where essentially all aftermarket crimps on a fleet of vehicles could be expected to give trouble in due course. Crimping and then soldering is more time consuming and ideally should not be necessary - BUT it works well. Ferrules are good when properly terminated. You could try pull apart tests and try measuring voltage drop between ferrule and wire using a significant controlled current flow. A 12V battery charger may provide enough current for this. I recently measured about 5 milli-Ohms contact resistance across an XLR/ Cannon plug-socket connection at about 15A - not too bad for what is usually used as a microphone connector :-). I'h hope that a crimped ferrule would perform at least as well. Careful probing will allow you to measure voltage drop across the actual crimp. I've found proper tools for crimping the ferrules. My main concern is that the square shape of the crimped ferrules is not a good fit for the round terminals. Do you think that resistance will be a problem with these squarely crimped ferrules? I see those for sale on Amazon for $US309.50 (free shipping). At that price I'd hope that they'd sing, dance, fly and produce crimped ferrules suitable for any application. They may do some of these things :-). Followed (in price at least) by the $37.89 Samyo Portable Professtional AWG23-10 Self-Adjusting Hand Ratchet Crimping Tool Crimping Pliers for Cable Ferrules RBW06 (Red) which has 6 jaws and MAY give a better result, or not. Followed by a whole range of alternatives of increasing price - and of possibly increasingly capability. The 6 face Samyo looks like it MAY be worth a punt. Note cable capacities when comparing. You absolutely, positively do NOT want to solder anything in this environment. When you put a solder-tinned wire under a screw terminal, the solder will "creep", causing the connection to loosen over time and become unreliable. On the other hand, if you solder a ferrule to the wire, the dissimilar metals (brass? ferrule, tin/lead solder, copper wire) will undergo galvanic reactions in the presence of moisture that will cause a similar reliability problem. Another factor is that the point where the solder ends (in both cases) will become a high-stress area for the wire in terms of flexing and/or vibration. The wire can rapidly fatigue and fail at this point. The best thing to use in a screw terminal is either a bare copper wire, or a crimped ferrule. Non-conductive grease can be used to help keep moisture out of the connection. Crimped connections are extremely reliable if done well. 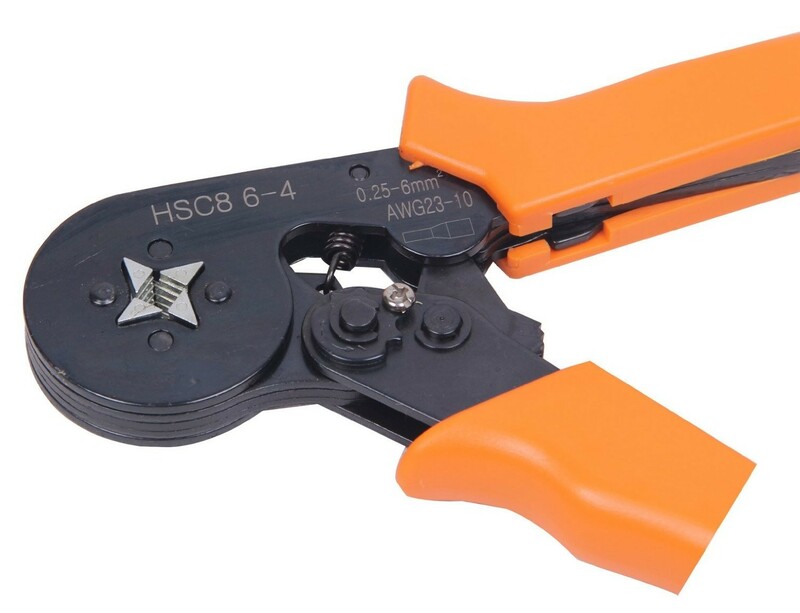 A good manual crimping tool will have a ratchet action (once the crimping action is commenced it must be completed to open the tool to release the terminal*) and will typically be quite expensive ($1,000 USD is not unusual). Cheap crimping tools just squash the stamped barrel on typical cheap terminals, and the results are often not very good (the wire can pull out, loosen over time or even be sheared off). You could consider soldering a wire into the barrel of the terminal- the main disadvantage of that is that the wire will tend to break from vibration right where the solder ends. You can mitigate that by sliding a bit of heat shrink tubing over the wire to act as a stiffener and to insulate the barrel. One good thing is that the life in terms of operating hours of a car are extremely limited- if you drive the car for 100,000 km at an average of 40km/h, that's only 2,500 hours or just a few months of 24/7 industrial operation. 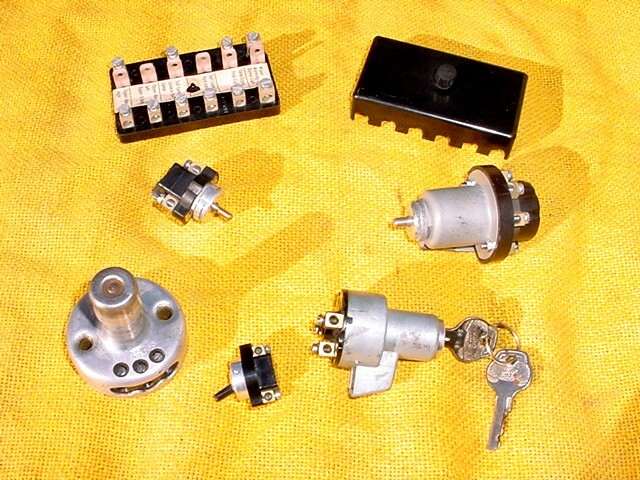 Automotive switches might only have a life of 5,000 operations. * at least in a straightforward manner- there's typically some way to release the ratchet if something goes really wrong. Those are not regular "screw terminals", they are a terminal where the end of the screw presses against the wire. Crimped "eye" or U connectors are worthless here. Basically, you strip just 1/4" or so off the end of the wire, insert into the terminal block, and tighten the screw. Ideally give the strands of the wire a slight twist before inserting, but no need for anything fancy. If you're really obsessive, add a little contact grease to the end of the wire before inserting. If the wire is very lightweight, you may want to strip about a half inch, twist it lightly, then bend it over double, to provide more bulk in the terminal. If you can find them, there is a sort of ferrule made for this situation (particularly when the wire is fairly light or frays easily). It is only the "crimp" piece, with no extension (though it may have a "collar" on one end, designed to extend over the insulation and relieve stress), and it is made small enough to fit inside the hole in the terminal. You insert the wire into the ferrule, crimp slightly, just to hold temporarily, then insert the assembly in the terminal and tighten the screw. The force of the screw completes the crimping process. Occasionally, especially if the wire will likely need to be disconnected from the terminal several times, it's a good idea to put a dab of solder on the very end of the wire, to hold the strands together. One alternative is a pin crimp connector. I recommend a crimping tool that indents the barrel rather than just squashes it. The connectors come insulated or bare. On a car, a corrosion would still be a problem, I would explore rust proofing agent that would not obstruct conductivity, and apply it to the connection. Using a bare connector and soldering it in addition to the crimping would make mechanically solid connection, but both the wire and the connector are made of copper, and adding led may in a presence of salt and water lead to corrosion. Not the answer you're looking for? Browse other questions tagged wire automotive termination terminal or ask your own question. 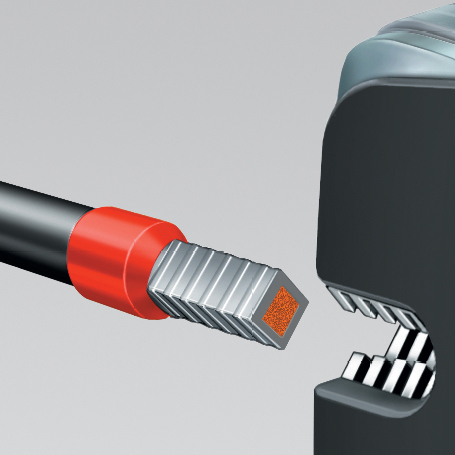 Electro-Mechanical Connection: from screw straight up to electrical-wire? What PCB wire termination should I use for high-vibration environments? Alternatives to screw terminals, breadboards for prototypes? Does an ideal wire dissipate energy? Is it possible to securely connect 20AWG wire to CR2 battery terminals?